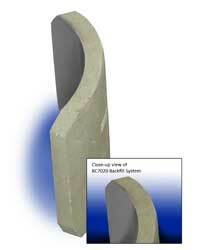 BC7020 is a lightweight two-component epoxy backfill system. Unlike BC7010, the filler portion is pre-blended into the resin and hardener components for easier handling, thus simplifying the mixing process. BC7020 is ideally suited for foundry applications involving mold and core construction.